1. I stepped down from Beary Box last month. It was a hard decision for me because they are all so awesome over there but I have to much to do and felt I wasn't able to give it 100%. Congrats to Joey who's expecting her first baby!!! 2. I have been in and out of doctors offices for a variety of reasons!! One was my leg. That was a mess. I had the biggest cankle for a week!! It was painful. Note to self... If you leg is itchy after you shave them DO NOT SCRATCH!!!!! It was all infected and... I will spare you the details. Jordan was in with a perforated ulcer in his throat. Then I was back one more time for another thing and ended up becoming the human pin cushion, not to mention the ultrasounds. I NEVER WANT TO GO BACK TO A DOCTORS OFFICE AGAIN!!!!!! 3. I am trying to get caught up on projects that I started for the store. The good news is is that the owl mini album instructions are finished!! Just needs pictures. 4. I went to the cabin with the girls at the end of Feb. That was awesome. I love going up there. No one around... that's a lie. My friend got her car stuck in the drive way (mountains of snow!!) so we had to get the guy down the street to pull us out. 5. I went to Canmore with my Mom, Gma, Amanda, Ash, Erin, Erin's mom Karel, and Eileen. Lorna always does such a good job with her retreats. We were up till 4 in the morning and up again at 8. I was so sleep deprived by the time I got home on Sunday. My sister (who doesn't scrapbook... well she does now) did an awesome Job and was up late with us every night. She is so creative that one!! 6. Jordan and I celebrated our 5 year anniversary. We are going away this weekend but went for dinner at the Japanese Village on Saturday night. That place is awesome!! GO!!! 7. It's time to get a "Big Girl Job" which makes me sad because I love working at the store and Robin and Lori are SOOOOO good to me. I've been sending out resumes left right and center. I will still work at the store though, just not as much as I do now. I love it here!!! 8. My dad is gone!! He's moved to Abu Dahbi. He will come back for two weeks in May and then they are gone for 5 years!! YIKES. I got to talk to him on yahoo chat last night. We signed I love you over the web cam and I wanted to cry. I am such a family girl that I can't imagine not seeing them all the time. Jen, Chloe, and Austin will join him there before the new school year begins. You can bet I'll be visiting next year for sure!! It looks amazing there and I am so excited for them!!! I will try to not let this run away from me again!!!! At least once a week is my goal... HA HA HA!!! This is me and my girl friends on New Years this year. It was a Mardi Gras theme (as you can tell by the beads hanging around our necks!!) One of my best New Years ever!!! 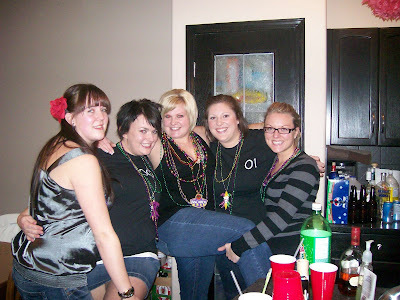 Me and my friend Ashley (second from the right) threw it at her place. We must have had like 30 ppl there. Parties with these ladies are never dull!! Well that was fun!! I am so excited for this weekend!!! 8 of us are heading out to Canmore for another retreat!!! My little sister is coming this time and I can't wait. I love getting out of town!!! Where to start...I am 23. I come from a very big blended family. I am a scrabook fanatic!!! I think I collect more than I scrap tho....I love to teach others about this hobby of mine!!! I love designing, playing around with new products and passing on the love! !